The infamous series of unexplainable murders in Hinamizawa have been solved and the chains of fate have broken due to the efforts of Rika Furude and her friends. Rika believes she has finally obtained the normal and peaceful life she desired with her friends; however, she is proven wrong when the wheels of fate begin turning once again after an unfortunate accident. Rika suddenly finds herself in a "perfect" world, the constant cycle of brutal killings having never taken place, where all of her friends are content and satisfied. Not wanting to abandon the world that she fought so hard for, she learns she must destroy an essential "key" to get back. But can Rika abandon the faultless world she is given the chance to live in, after all of her battles have brought her this far? This OVA is broken into two basic sections: Silly episodes (the first and last) and plot episodes (the middle episodes). You will likely not enjoy the silly episodes if you did not enjoy the silly/cute side of Higurashi. If, on the other hand you liked the antics throughout Higurashi, the silly episodes will probably just make your day. (They were the highlight of the OVA for me, though that's just personal taste). The plot episodes have more of a traditional Higurashi feel to them - suspense and mystery are essential elements, though it's a different sort than we're used to, I would say it's much more 'subtle' than the main series. I can't say I enjoyed these episodes quite as much as the main series, but I felt that they were still entirely worth watching, and were very well-done considering the options open to the storyteller at this point in the story. In short - If you watched Higurashi, you should enjoy this. (If you didn't like the silly stuff, just skip the first and last episode). Even if you haven't watched Higurashi, the first and last episodes are still entertaining. To be honest, I was a little leery about picking up this installment of the Higurashi franchise. The first Higurashi series was a blast, but Kai left a bit of a bitter aftertaste with how it handled its two crucial arcs. Still, I wanted to see where the series could go despite not knowing what to expect and even after all of the questions were already answered. I’m glad I did. Be advised: The first and last OVA are nothing like the rest of this short series. They serve as comedic buffers to the main storyline in which humor makes virtually no appearances at all. In light of this, some viewers may see these episodes as out of place and understandably so. If you are a fan of the brand of humor Higurashi had at the beginning of its arcs, then you’ll be right at home here. Both episodes are full of pretty good laughs, and that’s saying something for a series that is more known for shocking its viewers. If it’s not your cup of tea, then feel free to skip them. The remaining episodes make little to no reference of either one, so critical information won’t be lost. With that out of the way, the focal point of this OVA can shine. The Dice Killing Arc, which consists of the middle three episodes, is everything that Kai could have and should have been. The storytelling displayed here is done exceptionally well, as everything moves at a decent clip. There isn’t an opportunity to slow down due to the short length of this arc, so each event cuts to the chase and moves on without having to resort to pointless dialogue or reiterated ideas to fill the gap. Despite the increased pacing, Rei never loses track of itself or advances too quickly to the point where information is lost. A note also has to be made for the vastly improved art and animation. Rei takes full advantage of an OVA’s increased budget and sports some very vibrant colors and smooth frame rates throughout its run. It’s nice to finally see a chapter of this franchise rendered with more attention to artistic detailing. Suspense can be a tricky storytelling element to use; if it is used too much, then the story can drag for unnecessarily long periods of time and become tedious to watch. Thankfully, Rei handles this aspect wonderfully. No time is wasted between each reveal, which keeps things fresh on the plotline. As each pro or con of the new world is revealed, the situation becomes more engrossing, and the viewer is pulled even further into Rika’s shoes. The ultimatum that she faces is one that anyone would have trouble answering. This new Hinamizawa is Rika’s equivalency of the Garden of Eden; it is the world without sin or tragedy that she has desired for her entire existence without the sacrifices that had to be made to get it. Watching her agonize over which world is the correct one to choose left me hanging on the edge of my seat and made me wonder what I would do in her situation. That kind of connection with a character is a strong device to use, and it is used perfectly. Higurashi no Naku Koro Ni Rei takes the pacing of the first season, the suspense of the second season, and combines them both in a neat, little package that doesn’t fail to deliver a solid story. With or without the first and last episodes, this series still brings some redemption to the franchise and vaults itself high on my list of recent OVA releases at the same time. Higurashi no Naku Koro Ni Rei [Rei] is the third installment of the Higurashi series based on the games created by 07th Expansion. Like the game, Rei covers the events after Furude Rika had finally escaped the meandering halls of fate, breaking the cycle of repetition. Rei serves as more of a side story, giving small view into life after reiterating summer. The first and last episodes of the set OVA's are for purely comedic purposes. Nothing really happens and the only insight we get into any of the characters is that Rena finds Keichii's 'sea-bear' cute. Yes folks Higurashi went there... they implied our brunette buxom wanted Maebara's little friend. The episodes in-between, 2 through 5 or the Dice Killing Chapter, serve as a more serious side story. Rika one day wakes up in yet another world where everything is seemingly perfect. Everyone she sees is spared of their sin's from previous realities, their souls not torn into shards waiting to be duck taped back together. It's an interesting setup, but it fails in it's execution. The three short episodes lack any sort of engaging drama, and the story is squeezed down your throat in slabs of monologue. I commend the tale for trying to shade in some background on Hanyuu, Rika's goddess companion, but I didn't find myself caring. Rei is more of the same. The art hasn't improved much from 2006 when the original Higurashi premiered. The animation was cleaned up a bit, and the colors a bit more vivid. It's somewhat disappointing considering this is an OVA. The sound work is still the same. The seiyuu remain untouched and the music is largely forgettable. The OP didn't really set an ominous tone like the first two shows did. No special effort seems to have been made in the production of Rei. The two comedic episodes are hilarious. Funny has always been a part of the Higurashi formula, and it was refreshing to watch an episode focusing on Humor. Rika's side story on the other-hand is about as engaging as wading through a swamp filled to the brim with molasses compared to the first season. Though it made the fifth episode all the more entertaining. After the dull chapter, the comic finale let me leave the realm of Higurashi with a sweet taste on my lips. The Dice Killing chapter, through all it's faults, posed an interesting dilemma: Which world would you pick, one you toiled endlessly to create yourself or a perfect one handed to you on a silver platter. The reality you molded from fate is imperfect but yours, you own it. Which do you keep? Higurashi no Naku Koro Ni Rei is a mixed bag. 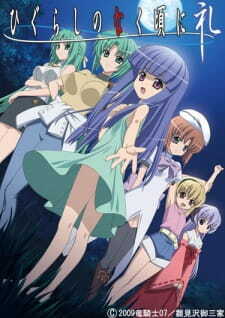 If you enjoy Higurashi's brand of comedy then check out Episodes 1 and 5. I couldn't recommend The Dice Killing Chapter except to the most rabid fans who care to know even the palest of brushstrokes on Hinamizawa's canvas. But if your that crazy your better off getting the sound novels. For the most part, the storyline is good. It is well thought out, and even original, and rather enjoyable. However, there is a thing about the first episode of Higurashi no Naku ni Rei. It doesn't quite fit with the rest of the Higurashi no Naku that we know. How to put it, it seems more like something we might see from "The Melancholy of Haruhi Suzumiya." Or maybe one of the random Omake from the end of Bleach This isn't a bad thing, but if one has come to expect something from a fandom, it might come across as an actual shock to the system. It doesn't quite fit, and one might feel that there were things let out, and that some things are overly exagerated. Enjoyable, yes, but probabbly not one expected. The thing is, before one makes the judgement of the OVA, don't drop it on the first one simply because it is different. It becomes more familiar as one goes. The art is very good, what one expects from Higurashi. To me... the sound... was awsume, but... it wasn't the same as Higurashi, or it was to simular. It kind of bothered me. This is one of the reasons I stuck around past the first episode. I love the characters. They are well developed and have their own personalities. One also sees a huge what if situation here too, seeing an alternative world that one could see and get ahold of. As much as I enjoyied the whole thing, I found the first episode, not what I had expected. It's a good series. Yes, I knocked down way low on some things, but really... it was for things that were very particular, and mostly dealt with that one first episode. Don't get me wrong, it was good, and did lead up to the next episode, but it was also odd... so be forewarned. NOTE: If you are wondering how the two "no Naku" worlds tie in, there is a clue dropped in the OVA.